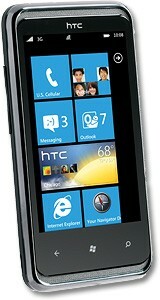 U.S. Cellular today announced the HTC 7 Pro, the company's first Windows Phone 7 smartphone. THe HTC 7 Pro is a rebadged version of Sprint's HTC Arrive. It has a slide-out, tilt-up QWERTY; a 5 megapixel camera with flash, autofocus and 720p HD video capture; stereo Bluetooth 2.1 EDR, Wi-Fi and GPS. The 7 Pro has a 3.6-inch display with 800 x 480 pixels, and a 1GHz Qualcomm SnapDragon processor. U.S. Cellular is selling it for $199.99 after a $100 mail-in rebate s tarting June 14. HTC knocks out the first Windows Phone 7 handset for Sprint in the Arrive, a sideways slider that has a full QWERTY keyboard and the latest software from Microsoft. Does anything set the Arrive apart from the crop of WP7 phones? Phone Scoop received an HTC Arrive review unit from Sprint today. The Arrive is the first CDMA Windows Phone 7 device for Sprint and offers a slide-out QWERTY keyboard. Documents seen on the Federal Communications Commission's web site reveal information about an unannounced device from LG. According to the documents, the LG LS831 supports CDMA in the EMSR band (800MHz), which only Sprint uses. Sprint and HTC today announced the Arrive (formerly the HTC 7 Pro), the first CDMA Windows Phone 7 device to be sold in the U.S. The Arrive differs a bit from other WP7 devices in that it has a slide-out QWERTY keyboard that can also tilt up for a better viewing angle. So, in other words ... 299.99 before mail in rebate? Yup. It's bad enough Windows phones aren't selling as much as they hoped but when they pull $hit like this, it's like they're committing suicide.